Some modern watch enthusiasts may not be overly familiar with lower-jeweled watches, that is, anything with less than 17 jewels. 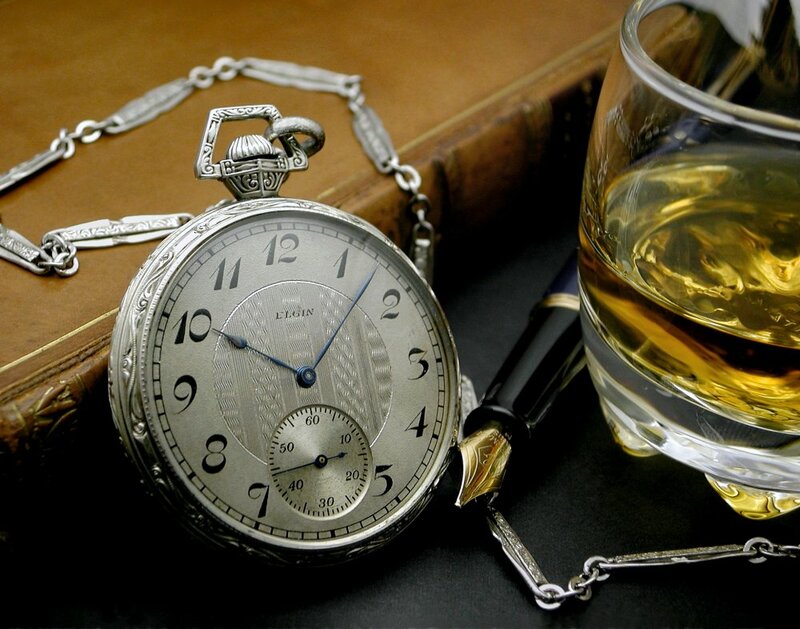 To vintage collectors, however, such watches are encountered quite often. The fact is that jewels are not required at all to make a functional timepiece. 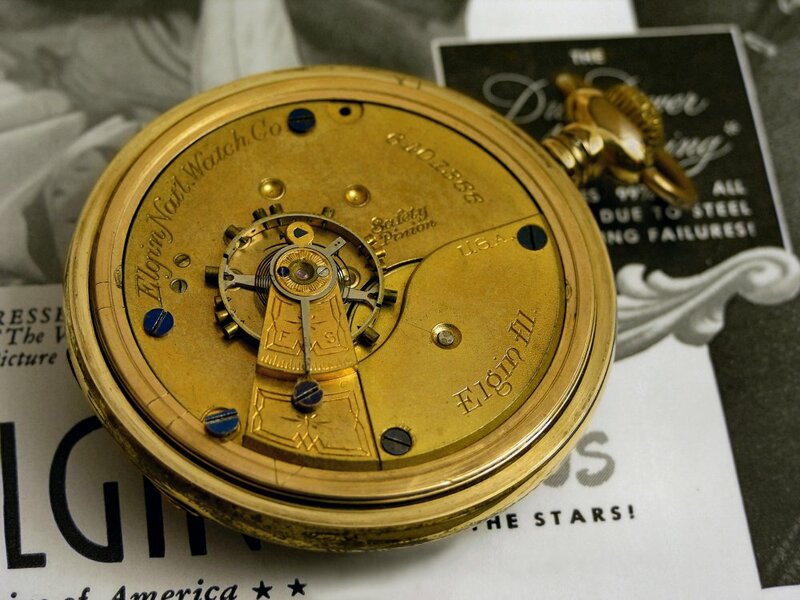 For the earlier part of the 20th Century, up to around the 1930s, a good mid-level quality manual-wind mechanical watch could be expected to have a 15 jewel movement. 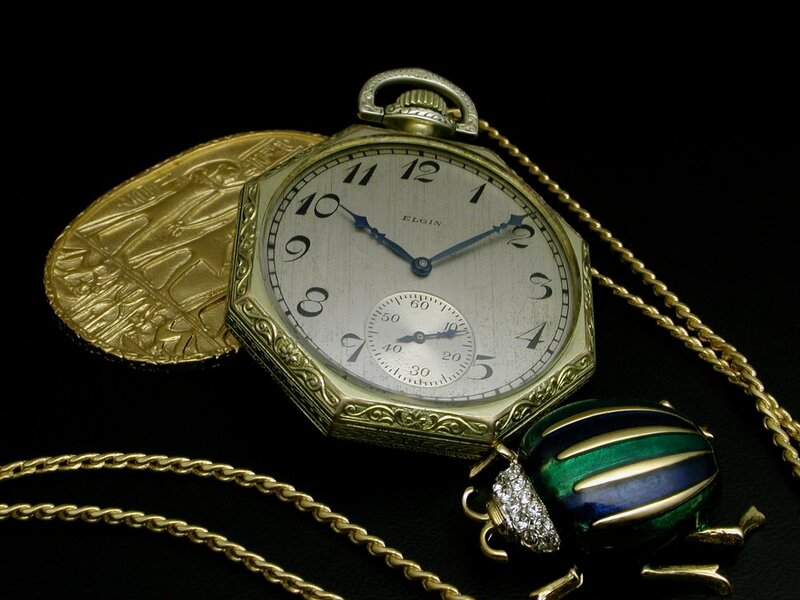 Earlier, especially pre-1900, a good quality watch may have had a 13, 11, 9, or 7 jewel movement. Prior to the development of synthetic jewels in the early-1900s jeweling was a more expensive proposition as the naturally-occurring stones needed to be mined, selected for suitability, prepared for use and then set in the movements in chatons. Therefore they were used judiciously, (you can find an article addressing the development of movement jeweling here). There’s also another world of watches below the 7 jewel level, particularly the one jewel and unjeweled watches that were made in their millions. Many are still around, still serviceable, and quite capable of keeping decent time within the limitations of their design. 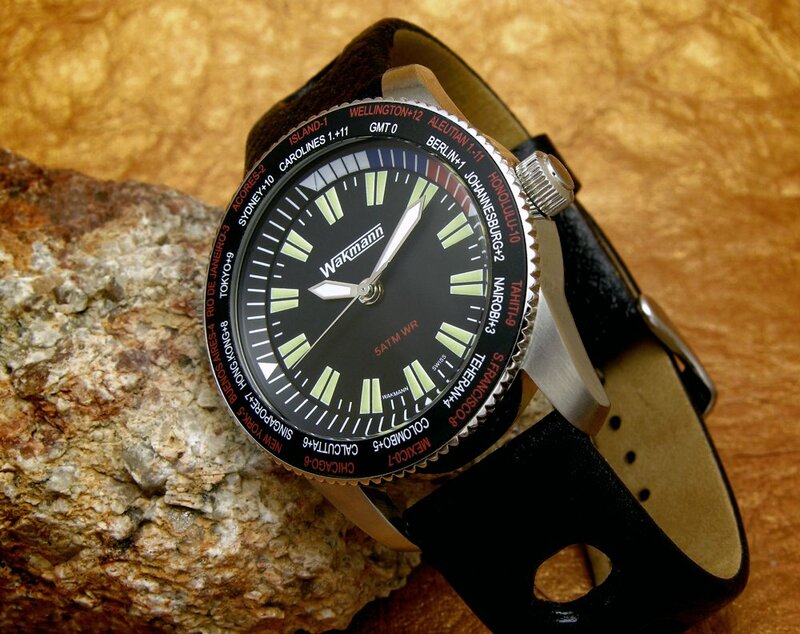 Some vintage collectors shy away from the lower-jeweled watches but I’m quite happy to have some examples and they provide much interest and enjoyment. In this post I will be looking at two groups of vintage (and antique) watches, those in the 7 to 15 jewel range, and those with 1 or no jewels. 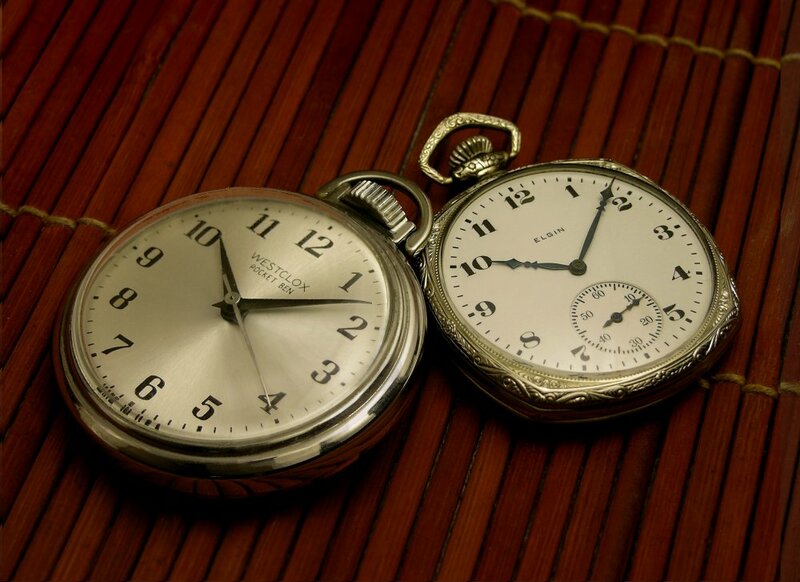 I’ll be using both pocket watch and wristwatch examples to illustrate points with an emphasis on the pocket watch movements as these were in production throughout the development of jeweling technology and practice. First up are a couple of English watches. 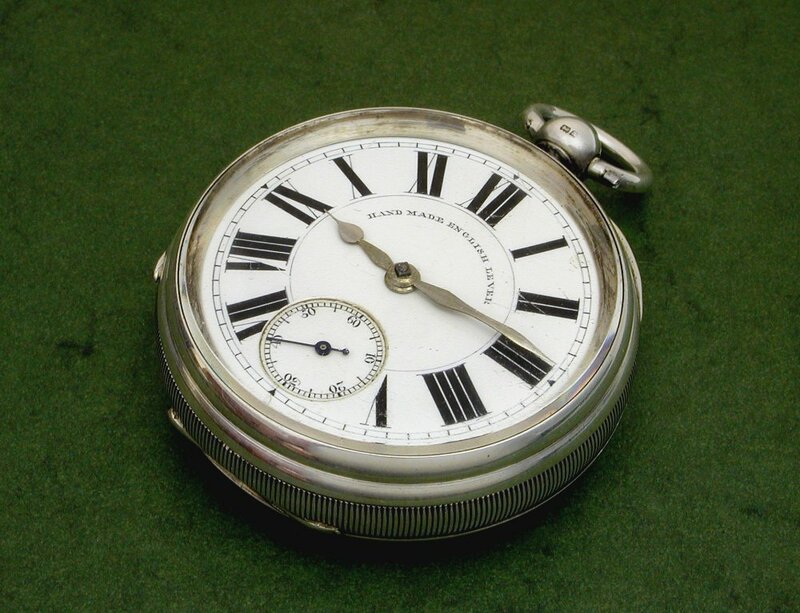 This English lever fusee watch has a 1901 hallmarked Sterling silver case, and no maker’s name. It has a 7 jewel movement and would have been considered a good quality watch. The English continued with this type of older design longer than, for comparison, the major American companies. The movements in these English watches were to a very significant extent handmade, and indeed this example notes this on the dial. Parts were hand fitted and there was little interchangeability of parts such as the American makers were working toward at the time and had largely achieved. Even the dial on this watch is hand painted. 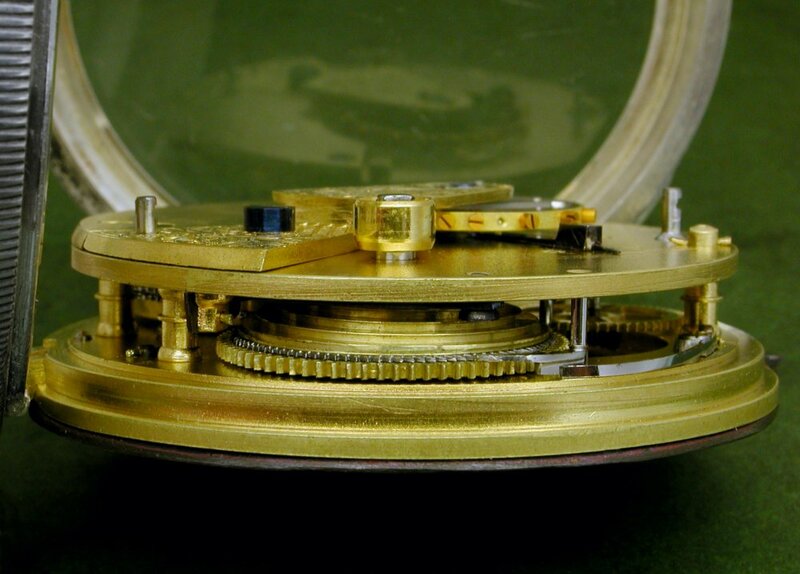 A fusee is a arrangement implemented to even out the tension of the mainspring as it unwinds. The power of the mainspring is transferred via a chain connected to a helical cone, the fusee. When fully wound the chain is wrapped fully around the fusee. The smaller diameter at the top of the fusee transfers less rotational moment than at the wider base. 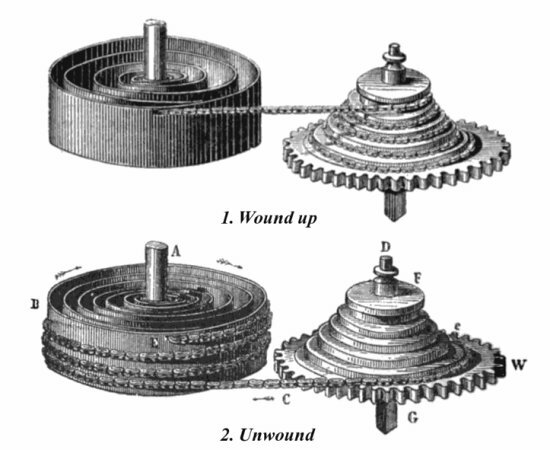 Thus as the mainspring winds down the fusee provides varying force to the train of the movement. This was an earlier method of achieving isochronism. 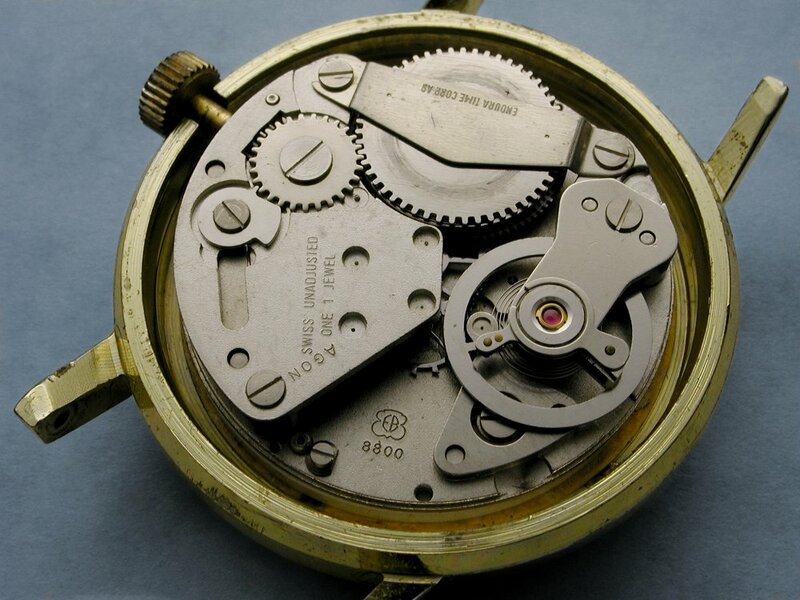 Below is a side view of the movement showing the fusee. 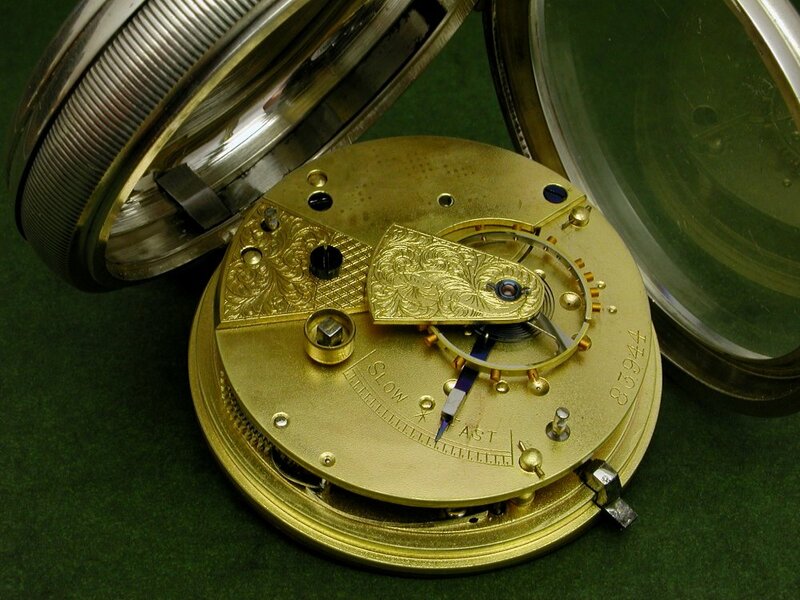 The movement is in the unwound state with the fusee chain wrapped only around the bottom of the fusee. By the way, the fusee chains themselves are quite impressive works of micro-engineering. All the links were constructed and assembled by hand. 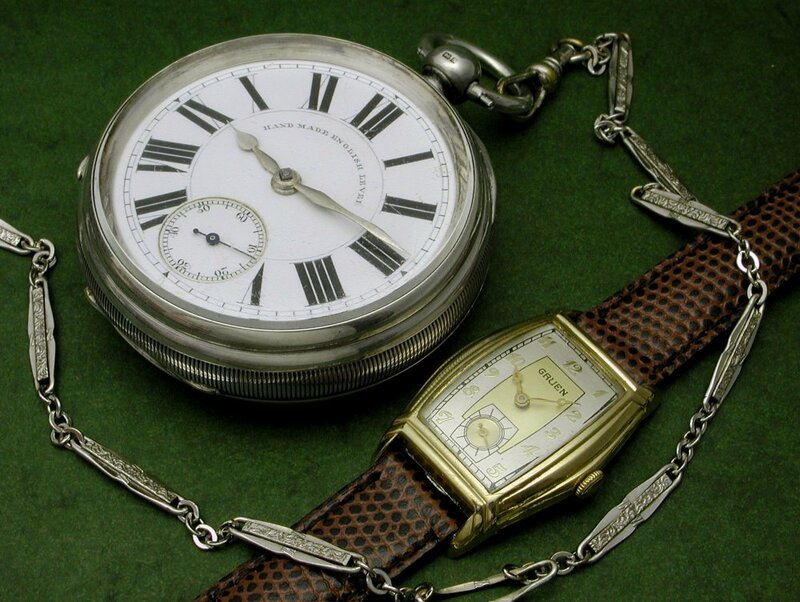 (Fusee image via Wikipedia: Dionysius Lardner, The Museum of Science and Art, Vol.6, Walton & Maberly, London, 1855)Here I have shown the pocket watch alongside a tonneau watch of a size common in the 1930s, just for comparison. This is a pocket watch that would require a substantial pocket! The next watch is also an English lever fusee in a Sterling Silver swing-out case. This is an heirloom watch bought back from World War I service by my grandfather. 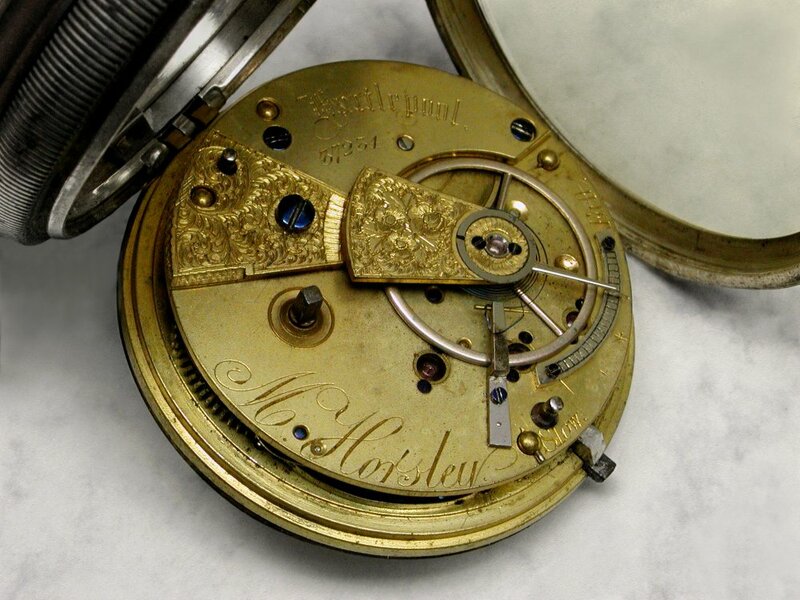 The watchmaker is M. Horsley of Liverpool, England, and the case has a London hallmark for 1874. Thus the faster moving train wheels are jeweled as well as the relatively quickly turning escape wheel, adding significant useful jeweling. Note that both of these watches have English lever escapements, an earlier development than the more common Swiss inline lever escapement collectors may be familiar with. You can see an illustration of the English lever in action here. 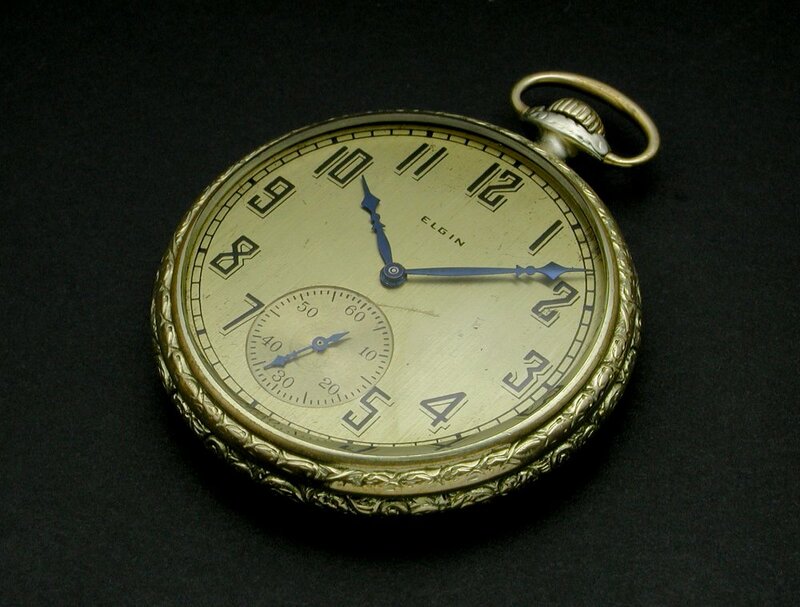 I’ll now move on to US made watches with this 1895 Elgin Grade 96 Model 2, 7 jewel. This was the first pocket watch I acquired, many years back. The older full-plate movement design is evident. As in the previous watches the movement uses natural jewels, the widespread use of synthetic jewels still being some time off. The movement in this watch also uses the English lever escapement layout but with a club tooth shaped escape wheel rather than the straight spikes of a true English lever. Later US watches would use the Swiss inline type escapement. Note that this movement is lever set. 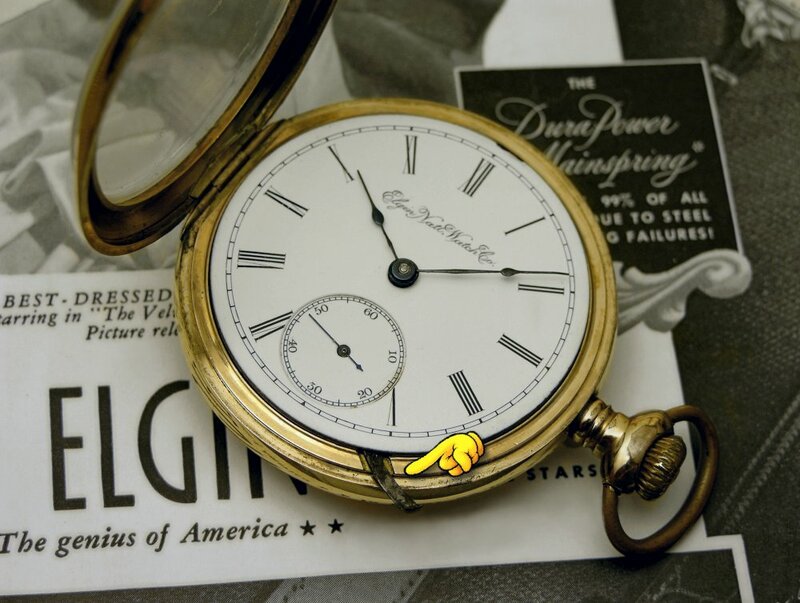 Unlike the more commonly encountered pendant set watches where the crown is pulled out to set the hands, on a lever set watch it is required to remove the front bezel (in this case it hinges open) and pull out a small lever at the 5 o’clock position as shown below. This engages the setting works and the hands can then be set via the crown. When the time is set the lever is pushed back in and the bezel closed. Whilst not as convenient as pendant setting this does afford that the time cannot be accidentally reset by inadvertent manipulation of the crown alone. 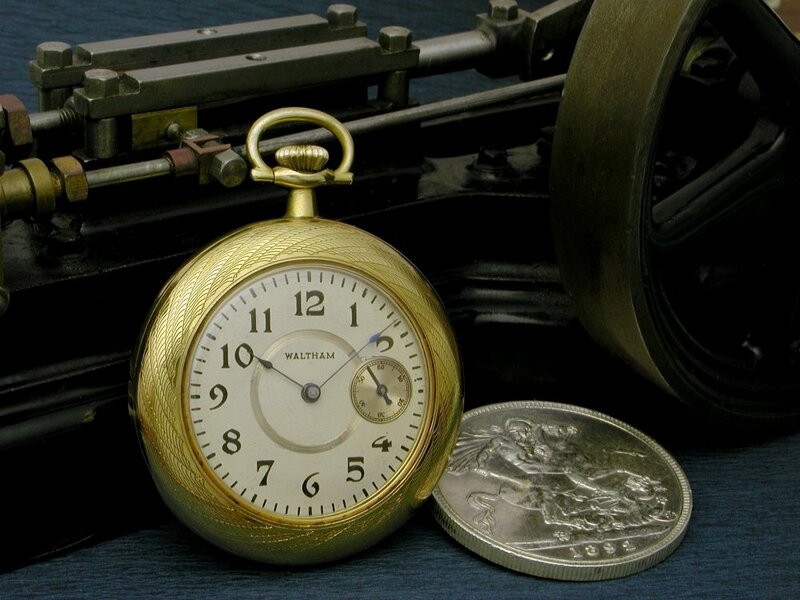 Being lever set was a requirement of Railroad Grade watches for some time, where an incorrect time setting could lead to trouble – trains colliding and other nastiness – let alone not being on time. 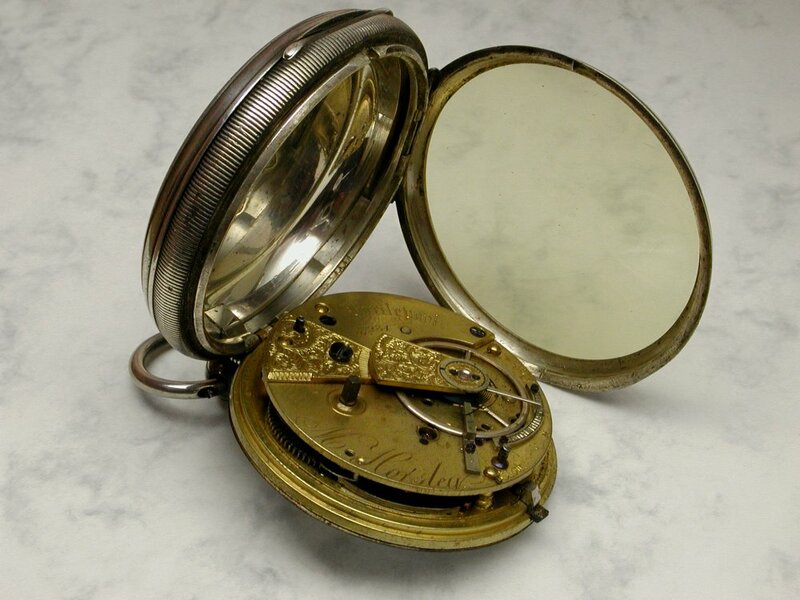 This particular watch is not of Railroad Grade, quite far from it, but lever setting was common at the time. Next is an example from Waltham, an 1890 Waltham Model 1889, 7 jewel watch. This is a good example of an earlier watch made just before the turn of the century when a 7 jewel timepiece would have been considered to be of good quality. Indeed, the movement shows very good finishing overall. Note that this is a relatively small 6 size movement, (approx 34mm in diameter), and there is a metal spacer filling out the case which is a ‘normal’ mens size of around 45mm. 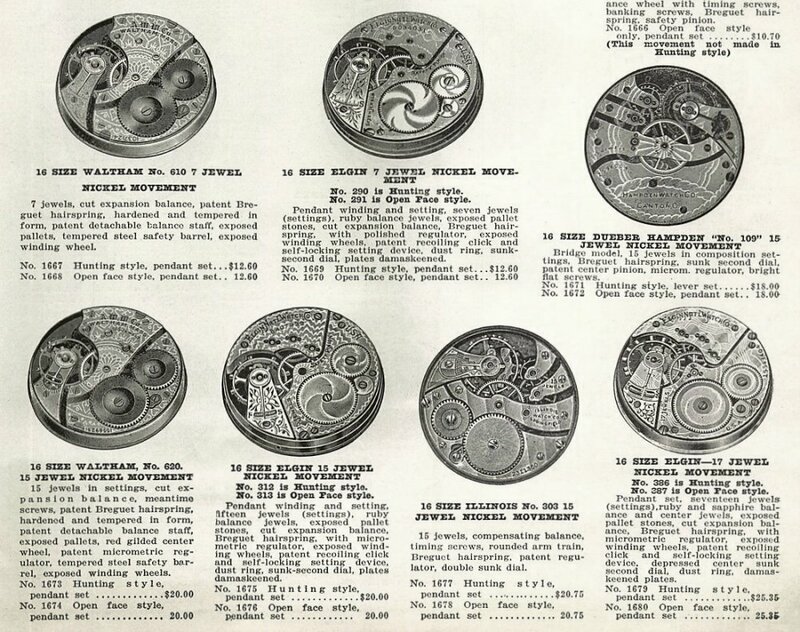 The 1915 supply house catalogue page below shows a variety of US movements available in models ranging from 7 up to 17 jewels. Note the difference in price between the 7 and 15 jewel versions of the movements from Waltham and Elgin – $12.60 for the 7 jewelers and $20.00 for the 15 jewel movements. A significant difference. Whilst synthetic jewels were in use by this time the extra jeweling was still an expensive process. Of course, on some models there will be a different level of finish, too. Plates may not have received anglage, for example, and parts such as a micro regulator would have added cost. However, something that becomes evident with US movements from these major makers, and particularly with the 15 jewel models, is that differently jeweled versions can sometimes be very similar in other respects. Quality of finish can sometimes be much the same, escapement components identical, and the lower-jeweled models may need only jewel settings as opposed to brass bushings to match the higher jeweled models. Clearly the companies could have done this but they chose to make the movements in the various jewel counts as there was a market for them. Buyers could opt to spend as much as they were comfortable with on a watch from the range offered. This would widen the appeal of the manufacturer’s product. Today, of course, a watch company putting out watches with anything less than 17 jewels in a manual-wind, (unless it’s a New Old Stock movement), would be most unusual indeed. Cost of components and processes have changed with technology and expectations have altered over time. 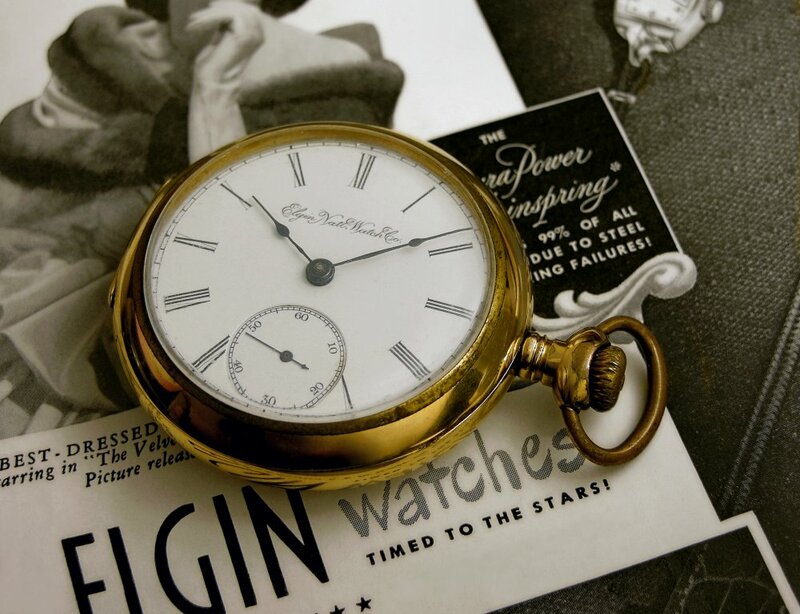 Both Elgin and Waltham produced a very large range of watches at varying price and quality levels, targeted at a wide market. They offered 7 jewelers up to high-end 23 jewel Railroad watches. As mentioned, it was not just the jeweling alone that differentiated the grades of movement, but also the time and effort (and expense) put into functional and aesthetic finishing and quality of components. Where the 7 jewel models were not as finely finished or equipped as the higher grades they were still very decent watches and would provide good service at a generally affordable price. 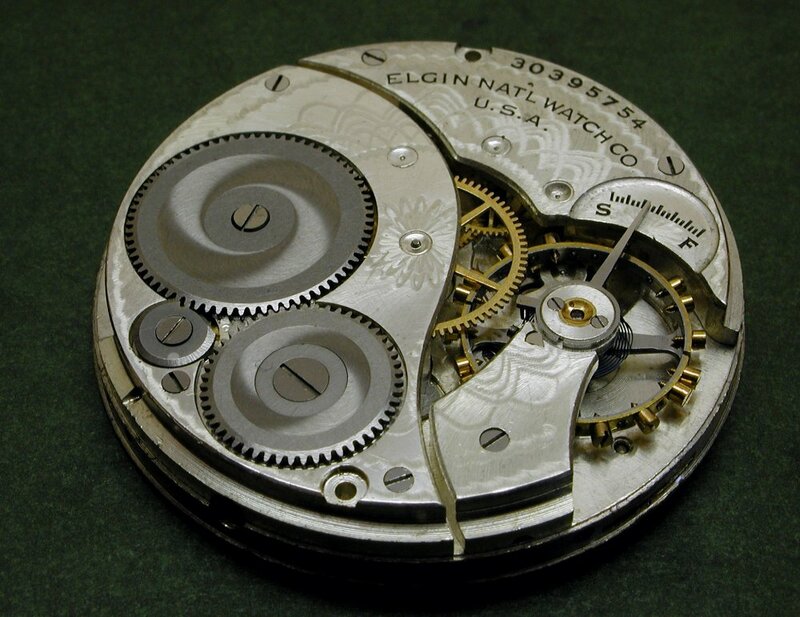 Here’s a representative 7 jewel US movement, the Elgin Grade 303 Model 3. 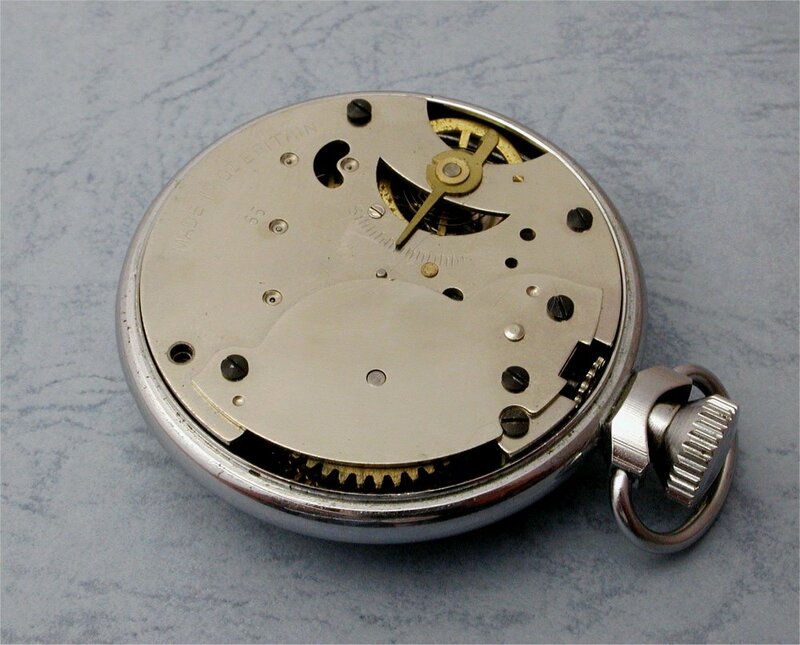 This is a 12 size, stem wound, nickel damamscened movement and was in production for approximately three decades starting in 1903. The 7 jewel version has the standard jeweling employed in the escapement with the train left unjeweled. The jeweling of the escapement is important for efficient operation. Minimising friction here will enhance both timekeeping and longevity. The escapement also greatly benefits in timekeeping capability from the screwed bi-metallic balance and Breguet hairspring. Having the train unjeweled was considered an acceptable compromise to allow lower production and sales costs. An article on the servicing of this movement can be seen here. Here’s a selection of three Elgin watches manufactured from 1924 to 1927 – all powered by a 7 jewel Grade 303 movement as shown above. Elgin made over 2 million various examples of these in 7, 15, and 17 jewel versions. …making a total of 15 jewels, all of which serve useful purpose. The center (hour) wheel, the slowest moving of the train and least likely to wear, is left unjeweled. With a very good level of finish and star micro regulator this movement is in all regards, bar jeweling, to the same quality of many of Waltham’s 17 jewel movements. From these 7 to 15 jewel, jeweled lever watches to the 1 jewel pin levers is quite a step down, both in quality and cost. The pin lever movement uses steel pins instead of pallet jewels to interact with the escape wheel. You can read a post on such movements here. Such an escapement was less expensive to manufacture and the movements were generally of low quality. This wasn’t the case for all pin levers, though. Oris, for example, were restricted by Swiss law to producing only pin lever movements from around 1934 up to the mid-1960s. As such they put more time and effort into this type of movement than most and produced a number of high-jeweled pin lever movements. They even managed to get a number Chronometer certified between 1945 – 53. Some other companies, even Timex, also produce highly jeweled pin levers. The vast bulk of pin level movements, though, were nothing to write home about. They weren’t junk, though, although many would appear so when compared to even basic jewel lever movements. “Junk” would imply they were not fit for their task when in fact, in the main, they were. They were designed and built down to a price whilst still maintaining the capability of reasonable time telling. The inherent impositions of the designs, such as higher friction, limited them but they did serve a purpose and offered inexpensive time pieces for those with limited means. This 1960s Endura direct read is an example of a 1 jewel pin lever watch. 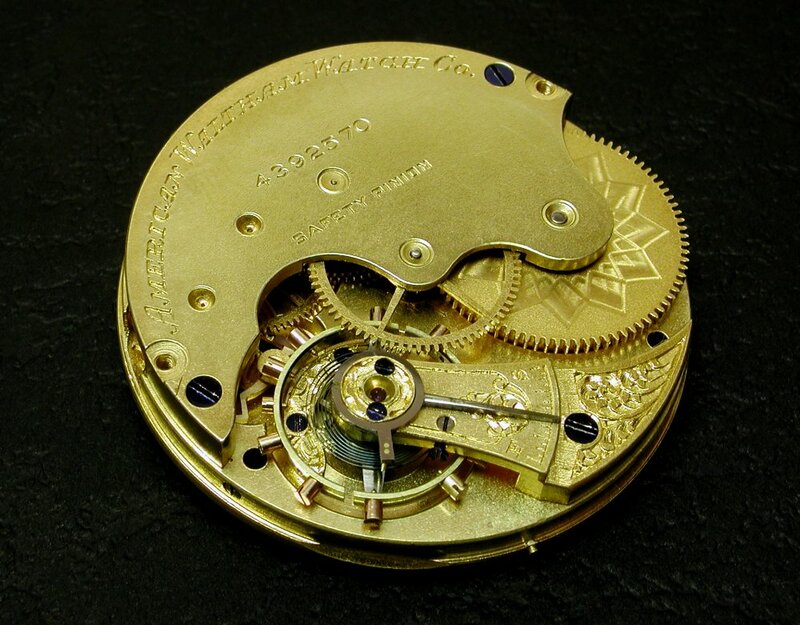 The Swiss were heavily into producing these inexpensive movements with offerings from movement makers such as Bettlach and Baumgartner being used in a multitude of watches. Endura is now part of the Swatch Group, dealing with custom private label watches. 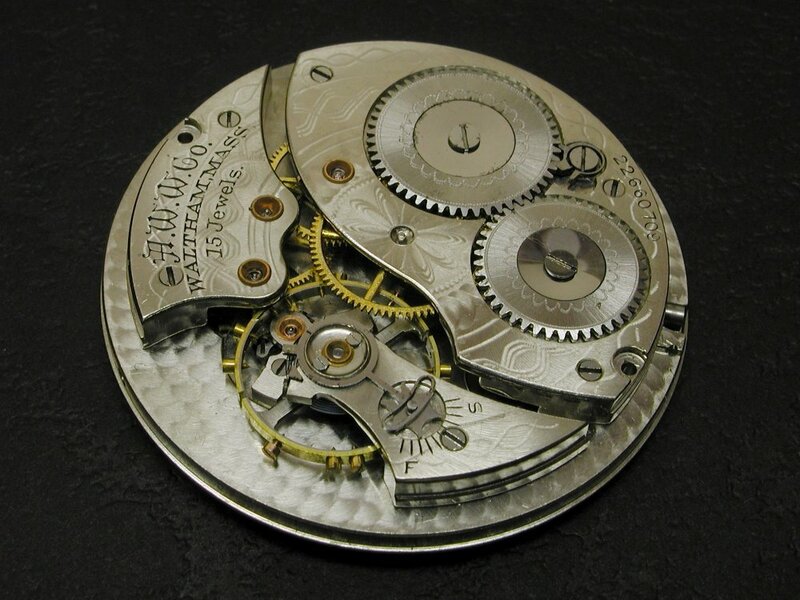 The movement in this watch is an Ebauches Bettlach cal. 8800. The one jewel in such movements is generally a cap jewel on the upper balance pivot. Here it does serve the purpose of supporting the balance when the watch is in the dial-up position, (as is common when the wearer is sitting). 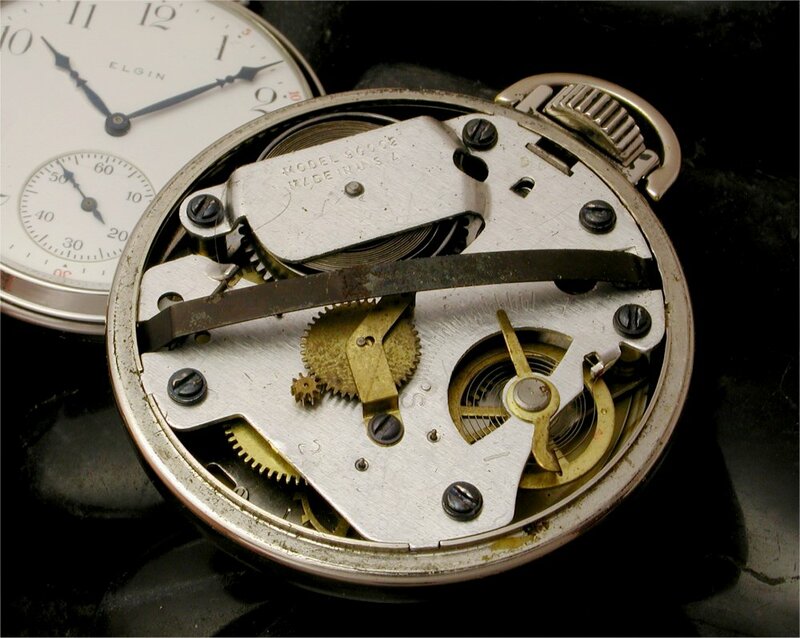 Whilst some of the more refined pin lever movements used conventional shock protection for the balance, for the majority of these inexpensive calibers there was no additional protection – the balance cap jewel is rigidly mounted. 1 jewel pin lever movements have been used in wristwatches in quite recent times. A modern example is this Wakmann world timer, made in the mid-2000s. Here you can see the Ronda cal. 1413 1 jewel movement in this watch. I believe these movements were made into the 1980s and would have been cased up into these Wakmann watches later. The movement is of reasonable quality for a 1 jeweler. 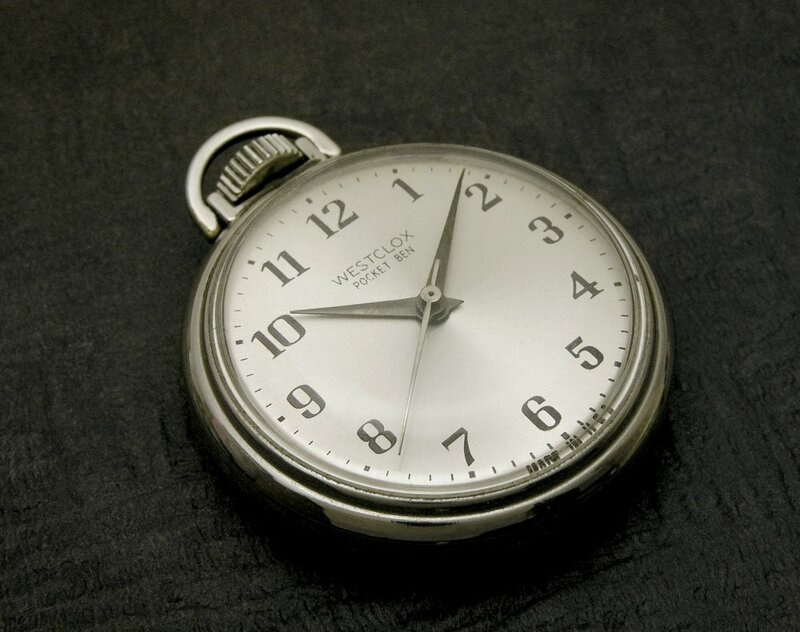 By the early-1960s inexpensive Timex pin lever watches had gained such a significant share in the US wristwatch market that major watch companies reacted by offering their own less expensive watch options through subsidiary brands such as Hamilton’s Vantage line and Bulova’s Caravelle watches. These companies took advantage of offshore manufacture and assembly to reduce costs whilst still providing decent jewel lever watches. They also embarked on some interesting comparison-based advertisements such the one below from LIFE Magazine for December 1968. Note that a 7 jewel watch is being compared to an unjeweled pin lever, a category of watch we will look at next. If you want to step down from the 1 jewel pin lever there’s really only one place to go – the unjeweled pin lever. There were plenty of unjeweled watches made over the better part of the last century. 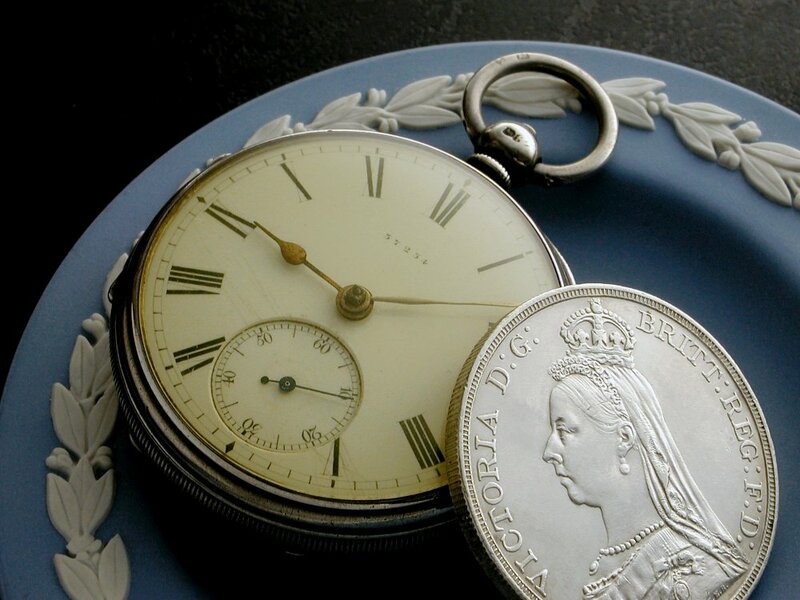 Ingersoll began producing unjeweled, very inexpensive, pocket watches in the US around 1895, offering an alternative to the more refined and more expensive products from the big US pocket watch manufacturers such as Elgin, Waltham and Hamilton. The “Yankee” was one of the first. 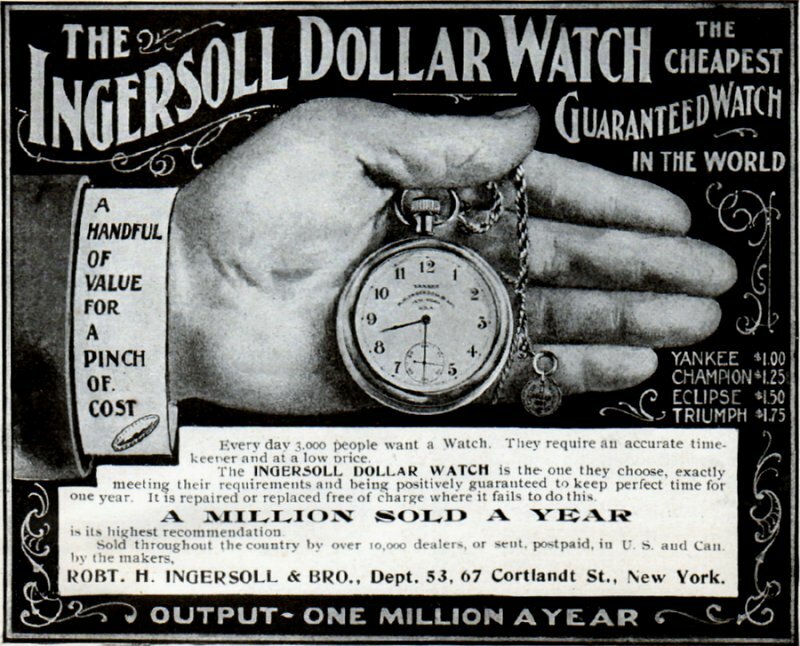 Ingersoll advertised the watches as costing the same as an average day’s wages, a dollar. Other companies such as Westclox, New Haven, and Ingraham also produced such watches which took on the general name of “dollar watches”. 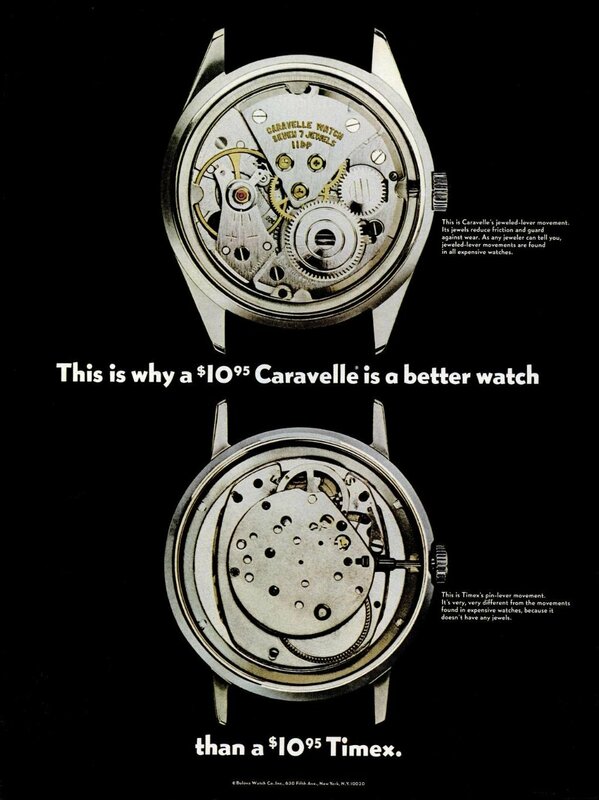 Note that according to the Ingersoll ad below they were already selling one million of these watches per year by 1900. They were very popular. Ingersoll dollar watch ad from Cosmopoltitan Magazine, 1900. Below is a Westclox “Pocket Ben”, one of the very many models of dollar watches produced to service the low-end of the market. This one was produced around the mid-1960s. Yes, that late. 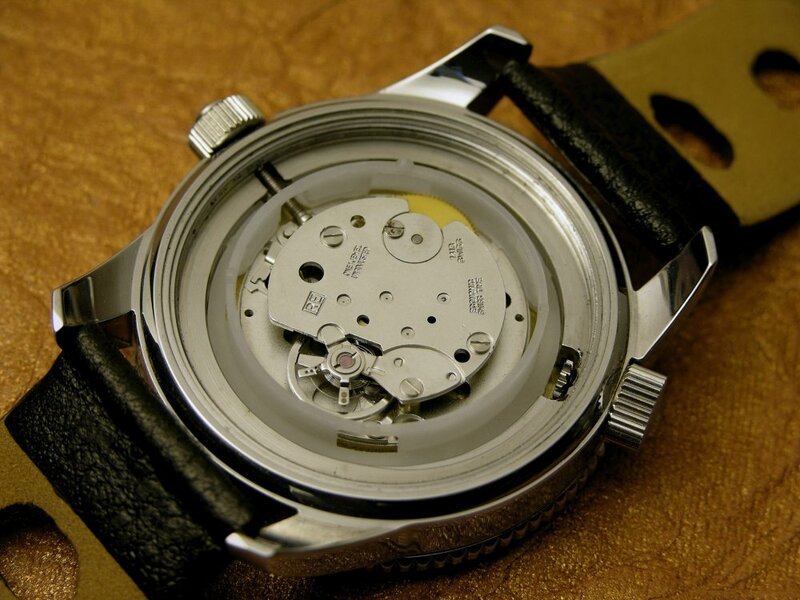 Many I have seen are in rather poor condition, the watches not really having been built to last as long as some have. The watch is large, measuring 50mm in diameter and 17mm thick, but is quite light due to the movement being of light construction utilising stamped metal plates. The snapback case, which is also fairly lightly constructed, is chrome plated and topped with a high-domed acrylic crystal. 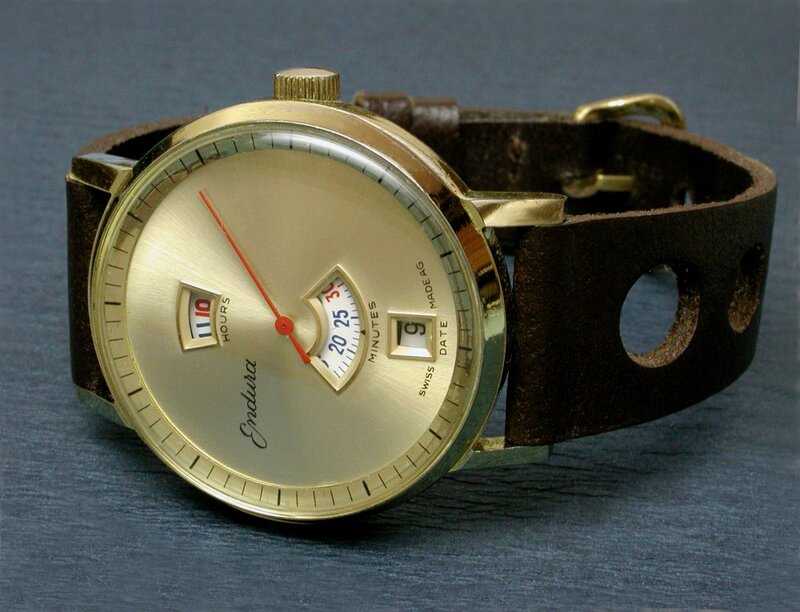 This watch has a metal dial but some models used paper dials to keep production costs down. The movements in these watches are very basic, often looking like they fell out of the ugly tree and hit every branch on the way down. This one runs at 4 beats per second (14,400 bph), and sounds more like a small clock than a watch. Wetsclox also made a series of clocks such as the Big Ben and Baby Ben. They even made a wristwatch called the Wrist Ben. Whilst crude in construction the movements are capable of keeping reasonable time. Due to the robust conical balance pivots these watches had a good chance of surviving rough treatment without recourse to expensive repair, something that appealed to those with little money to spare at a time when dropping a jeweled lever pocket watch, which had no shock protection, could pretty much guarantee a broken balance staff and a watch out of action. It’s interesting to note that some of the later (1950/60s) dollar watches carried “Shock Resistant” text on the dial, whilst having no ‘normal’ form of shock protection unit on the balance such as Incabloc, Kif, etc. I believe this marking may have been allowable due to the conical balance pivots providing sufficient shock protection to satisfy the ISO regulations shock test. These watches were manufactured in both the USA and Canada. 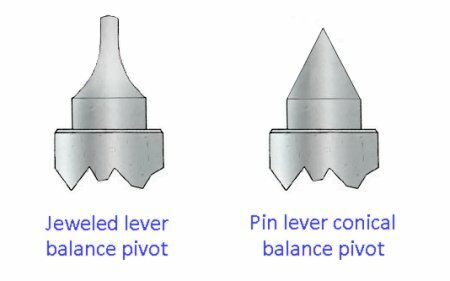 The diagram below illustrates the differences between the two types of balance pivots. The conical pivots do not have the fineness of the jeweled lever pivots and are more resistant to breakage. (Diagram modified from TZ Watch School Glossary).The movements could look a tad more tidy as this 1966 Smiths example made in Great Britain shows. This one has suffered a broken balance staff – you can see that the balance wheel is canted up on an angle. They were robust, but could be broken. I hope this post has provided some insight into watches with movements having less than the current commonly accepted minimum of 17 jewels, and that there are very valid reasons for them. Whether the lower jewel count is a product of the period in which they were made, due to economic considerations, or a combination thereof, they all served their purpose within the bounds of their particular designs and qualities. The earlier examples trace the development of watchmaking technology and the less expensive lower jeweled and unjeweled examples demonstrate the growing need and desire for timekeeping in society, particularly with the rise of industrialisation. From the unjeweled up to 15 jewel watches, they have done the job for many millions of people over time and for collectors there’s a large and interesting variety still available to enjoy. I’ll end with this photo representing both ends of the jewel count spectrum for this post – an unjeweled dollar watch and a 15 jewel Elgin. Thanks to Rob B for technical advice on the watches and movements. Watches and movements from the collections of Rob B and myself.